We deliver comprehensive ‘Teaching Music with iPads’ training for individual teachers, whole schools, Music Education Hubs, school districts and arts organisations. Our programmes are suitable for both specialist and non-specialist educators teaching ages 7-16, as well as workshop leaders, peripatetic staff and Music Co-ordinators in mainstream and ALN/SEND settings. You don’t need to be a musician or have any previous experience with iPads to benefit from our training. – A hands-on, beginners guide and overview to four key high-impact music-making apps, including Garageband. – Creating music videos and film soundtracks. – Creating and harmonising melodies. – Creating an iPad Orchestra/Band in your school. – Working with SEN/D and hard-to-engage students. 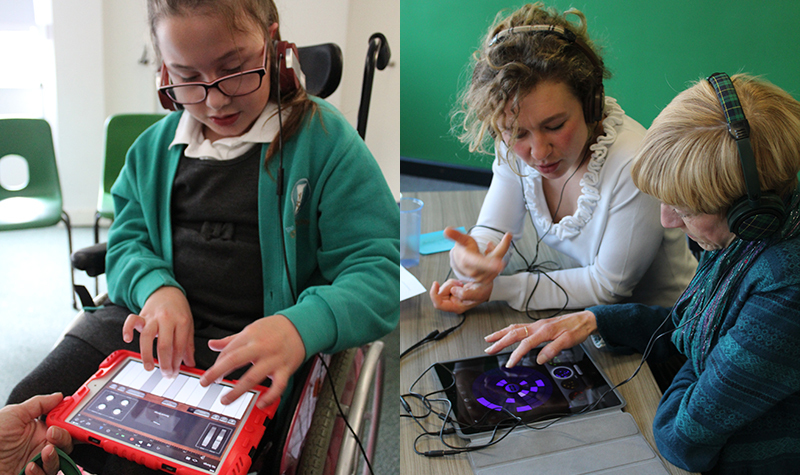 – Integrating iPads into the wider music life of the school, including choirs and peripatetic teaching. – A wealth of effective, practical ideas that can be used immediately in the classroom. – Confidence in your ability to deliver successful music technology projects. – A full set of resources, including video tutorials, assessment materials and a copy of our ‘Teaching Music with Garageband for iPad’. – Access to ongoing email support. We can tailor our training programmes to suit your needs. Contact us for more information.